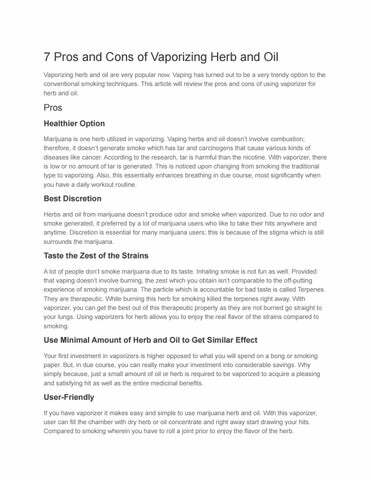 7 Pros and Cons of Vaporizing Herb and Oil Vaporizing herb and oil are very popular now. Vaping has turned out to be a very trendy option to the conventional smoking techniques. This article will review the pros and cons of using vaporizer for herb and oil. Pros Healthier Option Marijuana is one herb utilized in vaporizing. Vaping herbs and oil doesn’t involve combustion; therefore, it doesn’t generate smoke which has tar and carcinogens that cause various kinds of diseases like cancer. According to the research, tar is harmful than the nicotine. With vaporizer, there is low or no amount of tar is generated. This is noticed upon changing from smoking the traditional type to vaporizing. Also, this essentially enhances breathing in due course, most significantly when you have a daily workout routine. Best Discretion Herbs and oil from marijuana doesn’t produce odor and smoke when vaporized. Due to no odor and smoke generated, it preferred by a lot of marijuana users who like to take their hits anywhere and anytime. Discretion is essential for many marijuana users; this is because of the stigma which is still surrounds the marijuana. Taste the Zest of the Strains A lot of people don’t smoke marijuana due to its taste. Inhaling smoke is not fun as well. Provided that vaping doesn’t involve burning, the zest which you obtain isn’t comparable to the off-putting experience of smoking marijuana. The particle which is accountable for bad taste is called Terpenes. They are therapeutic. While burning this herb for smoking killed the terpenes right away. With vaporizer, you can get the best out of this therapeutic property as they are not burned go straight to your lungs. Using vaporizers for herb allows you to enjoy the real flavor of the strains compared to smoking. Use Minimal Amount of Herb and Oil to Get Similar Effect Your first investment in vaporizers is higher opposed to what you will spend on a bong or smoking paper. But, in due course, you can really make your investment into considerable savings. Why simply because, just a small amount of oil or herb is required to be vaporized to acquire a pleasing and satisfying hit as well as the entire medicinal benefits. User-Friendly If you have vaporizer it makes easy and simple to use marijuana herb and oil. With this vaporizer, user can fill the chamber with dry herb or oil concentrate and right away start drawing your hits. Compared to smoking wherein you have to roll a joint prior to enjoy the flavor of the herb. Easy to Customize This can be customized to meet your preference and needs when vaping. Reaching a specific effect from cannabis oil and herb will solely depend on the amount you consume. Vaporizers can change power and temperature settings, to generate the needed amount of flavor and vapor. Feeling Lighter A lot of users stated that they are functional after using vaporizers compared to smoking herbs. This might be due to the fact that vaping doesn’t generate hazardous smokes that in turn provide a clear headed high. Aside from feeling high, vaporizers are also portable, and available in small and compact sizes. You can store it in your pocket and take it anywhere you want to go. This is also the best device for busy people who don’t want the pressure of puffing their oils or herbs anytime and anywhere they want. Lack of Regulation One possible drawback of vaporizer is the lack of regulation of the government. So, it’s hard to say whether the quality or the approaches of the vaporizer is safe or not. Users can buy any vaporizers online with no limitation and paying taxes. overcome nicotine addiction. This just substitute the cigar with a vaporizer, however keep the level of nicotine. So, consumers only keep on keeping the nicotine intake on the other hand put off the substances present in cigarettes. Possible Medical Risk Vaporizers have possible harmful effects like dehydration. The propylene glycol substance can retain and absorb water which result in dehydration. Many smokers may be allergic to this substance. Apart from propylene glycol, substance like nicotine has harmful effects on circulatory system and blood sugar. It’s addictive and dangerous when breastfeeding. So, make sure to ask doctor’s advice prior to using vaporizer. Could Encourage Dual Use Critics of vaporizer worry that rather than e-cigs users substituting the conventional cigars with vaping, they might just utilize both with no limiting their smoking of cigar. Rather than replacing smoking with vaporizers, they will be adding vaporizer to their current smoking routine. This is bad for their well being and health, as you would only be layering a harmful practice on an already very harmful practice. 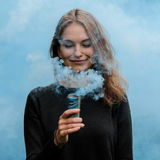 On the other hand, when clean air regulation keeps on using to vaping or vaporizers, the risk might be lessened or mitigate because users will not be capable of vaping or smoking in many areas, making it less convenient to dual-use. Limitations of High Quality Vaporizers on Hand There are lots of cheap vaporizers on hand. Some cheap vaporizers combust herb or oil instead of vaporizing it, so you need to be extra careful when buying one and don’t waste your time and money on buying limitations. Not the Best Option to Stop Smoking When you are searching for an option to traditional smoking which will assist you put off your addiction to typical smoking, this isn’t the best solution. Though you might save money in due course, first expense might be costly for high quality and superior vaporizer which will last for a couple of years.